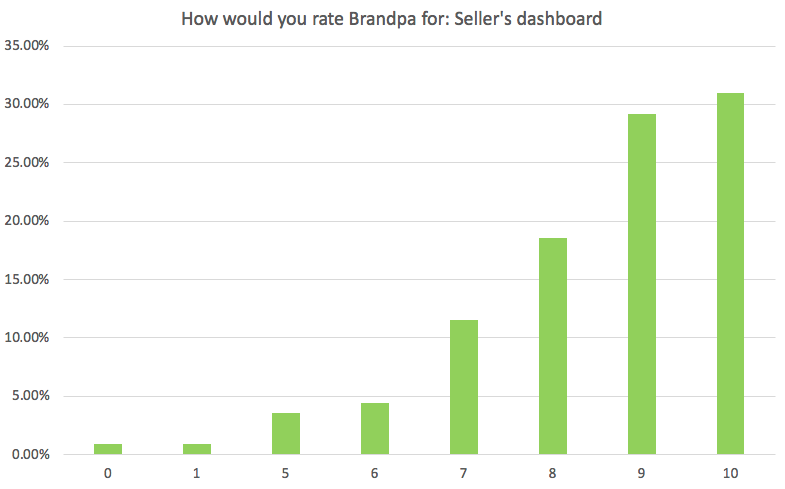 Earlier this year we asked over 1,500 of our sellers to fill in our first seller survey. Here are some of the results, and what we’re doing about them. 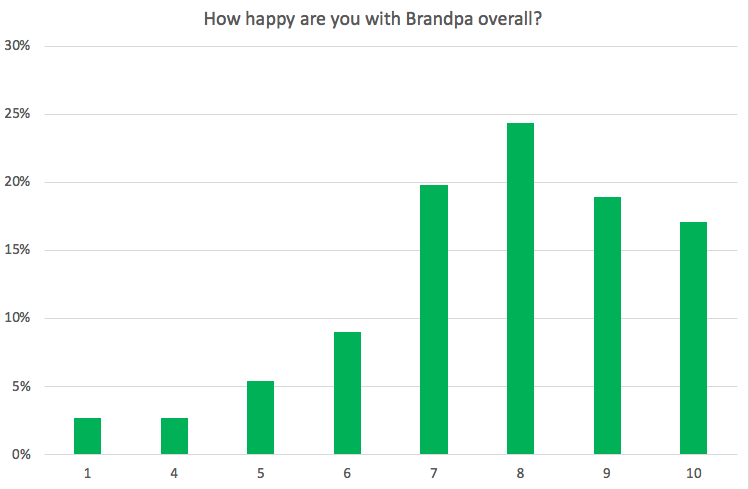 How happy are you with Brandpa overall? All scores out of ten. No seller gave us a score of 2 or 3 out of ten. All scores out of ten. 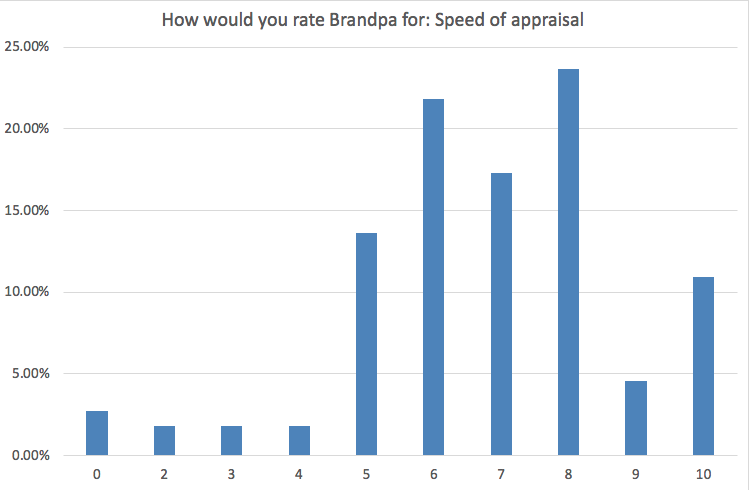 No-one rated Brandpa 1 out of ten here. We’ve improved since then, but we have plans to make this virtually instantaneous by the end of this year. This was our second weakest area, with an average score of 6.8 out of ten. Most sellers rated us 7 out of ten. All scores out of ten. Since then, we added the facility for sellers to suggest their own pricing when submitting a domain. Most of the time, we accept the suggestion, if we accept the domain. We’ll also soon be giving sellers the ability to control pricing themselves. 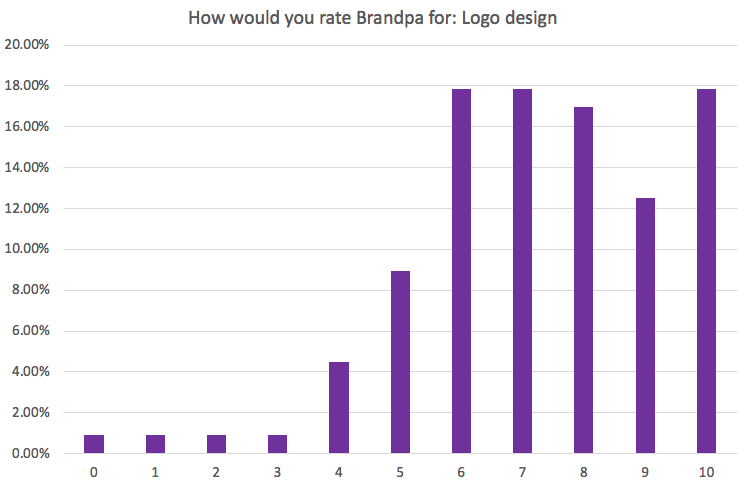 On average, sellers rated our logo designs as 7.3 out of ten. All ratings out of ten. We’ve since made a number of changes to how we design logos, and added 3D banners to all of our designs. All scores out of 10. No sellers rated us 2, 3, or 4 out of ten. Percentage of Brandpa sellers who say they have used another marketplace. Without giving too much away, we have plans to address nearly everything on that list before our next survey in 2019. Stay tuned! 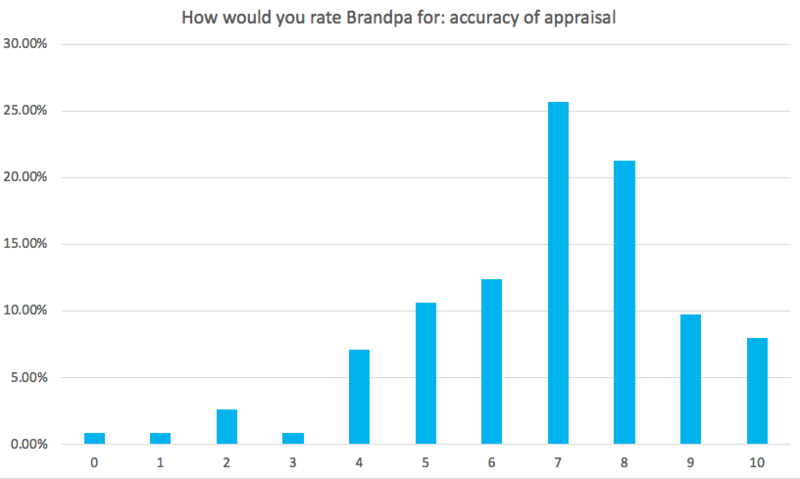 We spent some time digging into sellers who were unhappy with Brandpa, and we believe the most common issue was unrealistic expectations. For example, sellers who had listed 9 domains for a couple of months and were disappointed they hadn’t made a sale yet. We’re going to do more work to help clarify expectations over the next year. But as a small start, we put together a help article on how long it typically takes to sell a domain on Brandpa. We’d just like to share some of the lovely comments we received. Thank you all for taking the time to let us know what you think. We’ll be working hard on improving it all for next year! It is crystal clear your are listening to the sellers, providing better service to the buyer. You are setting good example and I hope the ardent initiatives that you are taking to improve Brandpa, will definitely bring fruits sooner than expected. I wish you all the best and full of sunshine. I most agree with “More outbound marketing” because it’s the end-users we want buying our domains. The domain industry has more than enough sellers. What we need is more buyers. I least agree with “Accept more domains” because we don’t need another marketplace where thousands of crap domains are buried. We need quality over quantity to make this marketplace effective and buyer-friendly. I am a new seller and I LOVE the user interface! WOW! Please don’t accept to many names! This is one of the thing that makes you great! I can’t wait to see what’s next! waiting for my first sale.